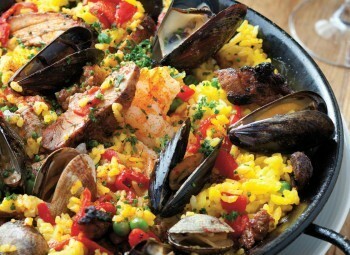 Paella is considered one of Spain’s national dishes, depending on the region it can be made with seafood, meats or a mix of both. At the Real Food Academy we like to prepare it with Black Rice or Sorghum, just precook the rice or sorghum in the broth (keeping about 1 cup for step # 5) and top with Kalamata Olives and Artichokes for a cool flavor profile! To prepare broth, combine the first 5 ingredients in a saucepan. Bring to a simmer (do not boil)until clams and mussels open, as soon as this happens, take them out of the liquid. Keep liquid warm over low heat. To prepare paella peel and devein shrimp, leaving tails intact. Heat 1 tablespoon oil in a large paella pan or large skillet over medium-high heat. Add fish and shrimp; saute 1 minute (the seafood mixture will not be cooked through). Remove seafood mixture from pan, and keep warm. Add onion and bell pepper to pan, and saute 5 minutes. Add the tomatoes, paprika, crushed red pepper, and 3 garlic cloves; cook 5 minutes. Add rice, and cook 1 minute, stirring constantly. Stir in broth, herb blend, and peas. Bring to a low boil, and cook 10 minutes, stirring frequently. Top with chopped Kalamata olives and artichoke hearts for a nice flavor profile!